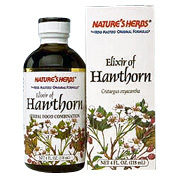 Nature's Herbs Elixir of Hawthorne Berries is a 100% pure, concentrated herbal extract of fresh, tree-ripened Hawthorne Berries which are harvested from their natural wild environment in the United States. They are then preserved with pure Grape Brandy, 8% alcohol by volume. Hawthorn is a small, spiny tree that produces brilliant red berries which were used in jellies and as a folk medicine. The ancient Greeks and Romans regarded the Hawthorn as a symbol of hope and happiness, hence its use for bouquets and corsages in weddings. The tree has been regarded as sacred because of the Christian tradition that it furnished the crown of thorns prior to the crucifixion of Christ. In fact, a stand of the trees still inhabits a portion of the Mount of Olives outside Jerusalem. Folk medicine holds hawthorn berries in high esteem in most parts of the world for its beneficial properties. Today, Hawthorn is being viewed by some scientists as a potentially important drug source. As an addition to the daily diet or as a tea, take 1-2 teaspoonfuls to a cup of hot water or with juice up to 3 times daily. Shake well before using. Refridgerate after opening. Concentrated extract of Hawthorn Berries in filtered water, pure Grape Brandy and Glycerine. Hawthorn Berry Elixir is shipped in a discrete, unmarked package. Orders are processed immediately and usually take about 3 to 5 working days to be received. We do ask that you try it for 2 to 3 weeks to feel the full effects. Any information received is used only for order processing and shipping purposes. Your information, such as e-mail address, will never be disclosed to a third party.